My husband doesn’t use exclamation points as much as I do, so when I received an e-mail from with two in the headline and five in the body I know he means business. This email was about an event that has taken over my mind for the last week—Top Fish. None of those steps seem very difficult and with easy-to-find lists online describing what is and is not sustainable, I am all set. Anyway, back to my husband’s e-mail. Top Fish caught his eye and made him think of me because I watch Chopped on repeat, I love fish and I have a little bit of a competitive side. Right away, I thought that I’d never have a chance and it just seemed silly to even enter, but after about an hour my husband had me convinced that I had a shot to win. Contestants were able to apply online by sending in a recipe that incorporated sustainable seafood. After giving the list a quick once-over, my eyes settled on squid. I love squid, my husband and I are big fans of the fishmonger at the Farmers Market on Sundays and we prepare it in different ways; my favorite has been when we use it in tacos or pasta. But this time I wanted to try something a little different. After thinking about all of the ways I have had it, I still thought about trying something I had never made before (later on I might regret that decision): Mediterranean stuffed squid. If Bobby Flay can teach me how, then it has to be a winner. So I sent in my application on September 13th and didn’t think any more about it. On the 17th, my phone rang with Chef Paul Buchanan from Primal Alchemy Catering on the other line—I had been selected as one of the five finalists! I had until the next Sunday, the 23rd, to have my recipe set to go in a public cook-off at his kitchen. I can’t tell you how excited and nervous I was, but just know I made this dish four times between Monday and Sunday and I have to thank all of my wonderful friends for being the awesome, supportive taste testers they are! The week flew by and there I was standing behind my own little stainless steel table with bowls and baking dishes and a pound of sustainable market squid. This squid looked so pretty compared to other squid I have worked with, the people at Santa Monica Seafood really helped out the competition and donated all of the fish that was used. Looking around at the four other contestants I had to say I was in awe. For a bunch of home cooks, we all showed up ready to go with some amazing dishes at hand. 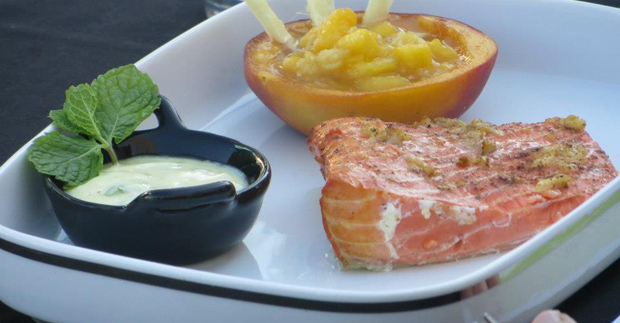 The other finalists were Doug Brand for his Cedar Planked Salmon With Peach Chutney; A.J. Dale for a Greek-Style Pacific Halibut With Lemon Feta Yogurt Sauce; Marnie Shiels submitted a Bananas About Sole recipe; and Dominique Smith’s Green Halibut Ceviche. We had 90 minutes to cook and put out four identical appetizer-sized dishes for the four judges. To say this was nerve-wracking would be an understatement; with the awesome prizes on the line you knew we all wanted to win. First Place would not only have bragging rights but they would win a pair of tickets to Sea Fare 2012 in October at the Aquarium of the Pacific, be featured in a Gazette Newspapers article and win a private dinner for six hosted by Chef Buchanan at Primal Alchemy. Second and third place would also receive a pair of tickets to Sea Fare and everyone would be taking home a pair of behind-the-scenes VIP tours and passes to the Aquarium of the Pacific. After 90 minutes in the hot Primal Alchemy kitchen, it was time to present. We each were able to explain our dishes to the judges (I skipped that part because I nervously just rattled off my list of ingredients but everyone else seemed to have a very interesting story to tell). After we all sent out our dishes it was time for a wine cheers and a tequila shot. The finalists know how to party. The grand prize winner was Doug with his fantastic salmon, then Dominque with her tasty ceviche, I came in third place and I have to say I was floored about how sweet everyone was about my dish. Fourth was A.J. Dale with her delicious halibut with lemon feta sauce and 5th was Marnie with the sole and bananas (by the way Marnie, I want your recipe, I loved it). Overall we had a blast and I came away understanding a lot more about the sustainable seafood movement, even if an onlooker holding his pound of salmon from Ralph’s didn’t really seem to understand it: “Salmon is salmon man, we’re all going to live!” Even though I appreciate his positive outlook on life I now understand that salmon isn’t just salmon, man.